This is a case of a 14 yo QH with an improperly healed fracture of a large left hind leg bone which prevented him from using the leg properly and moving or standing comfortably. At the time he was reclaimed by his owner, he walked with great difficulty. The injury to the LH is apparent in his odd stance. It prevented him from holding his foot up for trimming and thus all his feet had become overgrown. He was unable to hold up his feet or bend his legs in any way that allowed the toes to be trimmed, and no sling was available. Consequently, his toes were not shortened enough during his initial trims seen here. Typically, high heels are more common in the front feet than the hinds. Here the hind heels became high as a result of the injury. 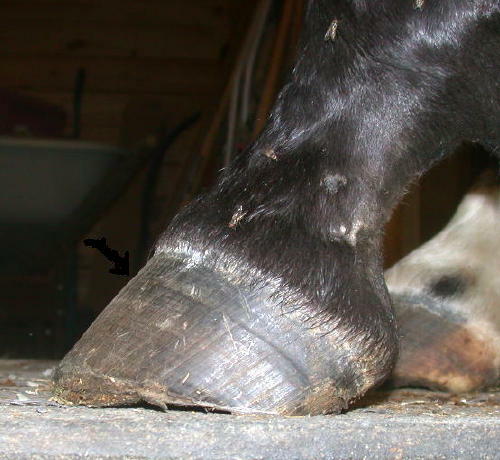 The Left Hind foot prior to trimming, and during the course of the next six months. Over the course of several months of very difficult trimming (because of the injury), the heel has finally managed to be lowered. 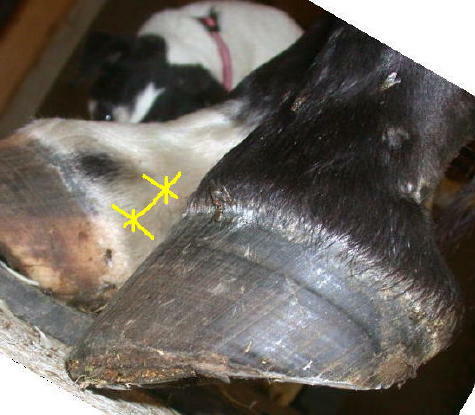 The third picture shows very clearly the new growth approximatley one third of the way down (yellow arrows) and its much improved laminar connection as the hoof form and toe angle becomes corrected. 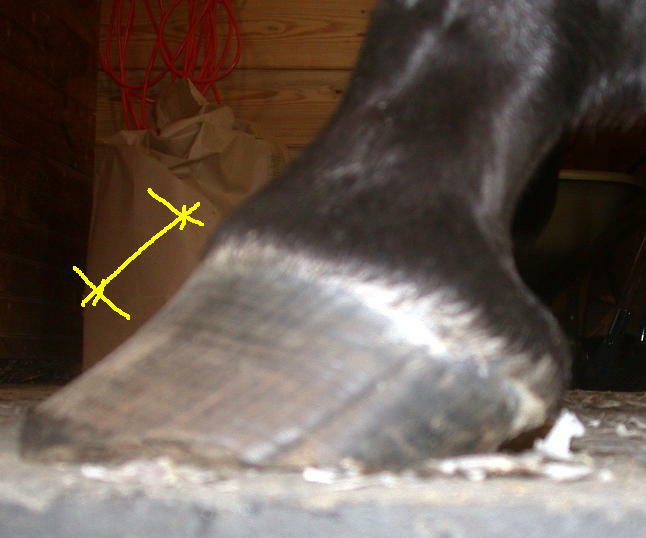 However, the toe angle is still shallow for a hind foot; it resembles that of a front foot more. It also shows a nice self-trimmed scoop (or arch) in the quarter, responding to natural wear. The horse at this point was able to trot and canter in the pasture (admittedly, in his own odd-gaited way), and started to boss around his pasturemate. Front feet – progress of trimming over the course of about six months. The high heels, combined with the long toe, cause the horse to stand with its front legs too far underneath himself. When the feet are correctly balanced, the cannon bones are vertical and perpendicular to the ground. When the legs are not vertically aligned under the horse’s body, the stay apparatus is not functioning as designed and the horse uses muscle energy to stand, using more calories. A hard keeper can put on weight when the stay apparatus is functioning once more. As the heels were lowered and the angles became more correct, the horse has begun to stand more squarely. (The front toe angles are also still shallow, partly because of the too-long toe). The heels were lowered without any detrimental effects to the digital flexor tendon. The last photo of the left front shows the improved laminar connection of the new growth (yellow lines).